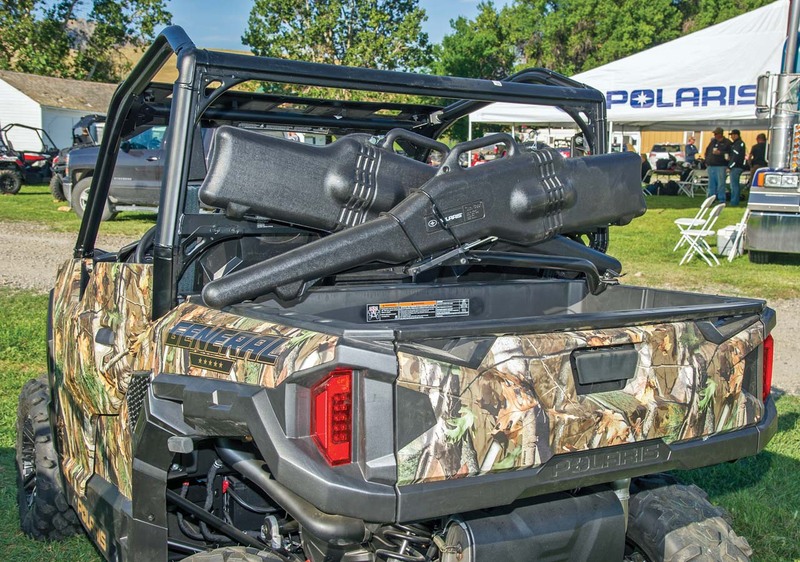 • Cargo bed capable of hauling 600 lbs. • Hitch rated for 1500 lbs. 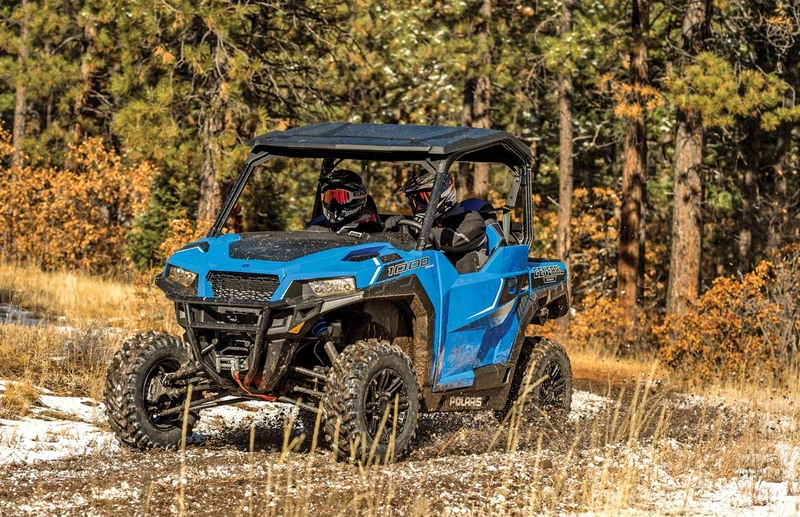 If you look at just the specifications for both the RZR-S 1000 and the new General, you’ll find a lot of similarities. It’s the subtle changes that make the difference, though, even with shared components. The most noticeable difference is the styling and the General has a look all its own. 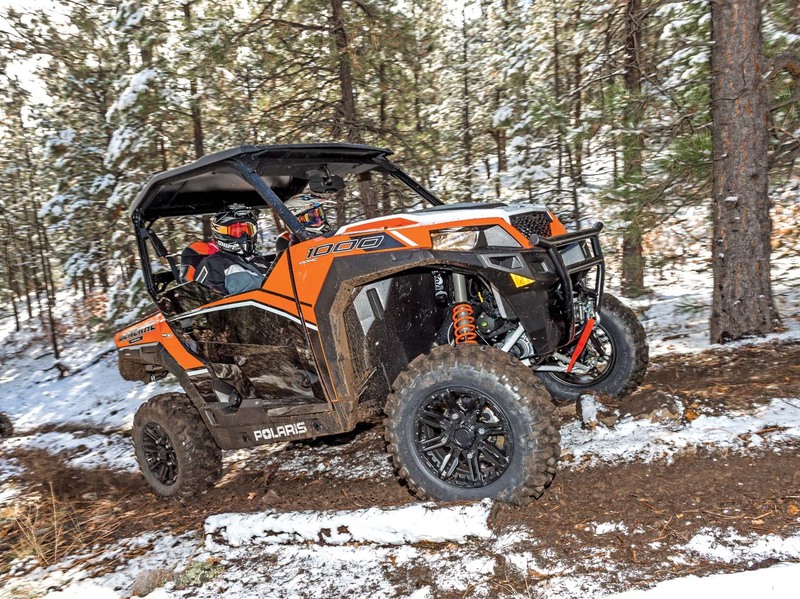 Polaris gave the General bodywork that matches its capabilities. The fenders protrude far enough to block most flying mud and water, but they also provide good sight lines over the hood for the driver and passenger. 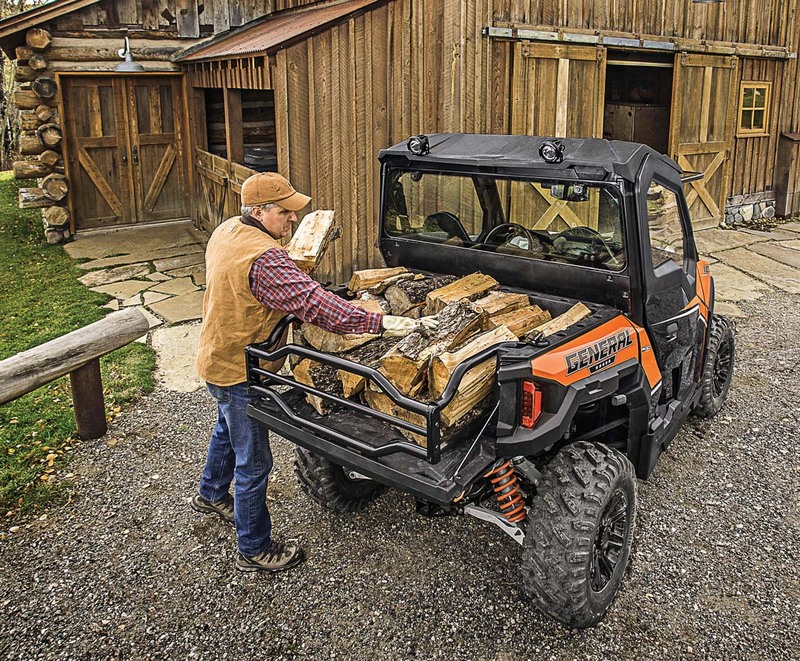 In the back is a tough, composite dump box (capable of hauling 600 pounds) with plenty of attachment points for the Polaris Lock & Ride accessories, but we happily toted firewood with it, and a cooler on trail rides. We spend a lot of our ride time on trails in the Northern woods, and the bodywork keeps branches and other trailside intrusions safely outside the cab. We are especially happy to have the doors Polaris included with the General, and they too really keep out the mud and brush. Most manufacturers are now equipping their Side x Sides with doors, but there is a big difference in quality and coverage. Polaris did a great job of finishing the doors on the General and on the inside there are no protrusions or parts to wear a hole in your knee. About our only complaint with the doors is they need a little adjustment to unlatch and open after a while, but this is easy enough. Thankfully, on the trail they don’t rattle or create extra noise, and the inside arm rest is a comfortable feature. 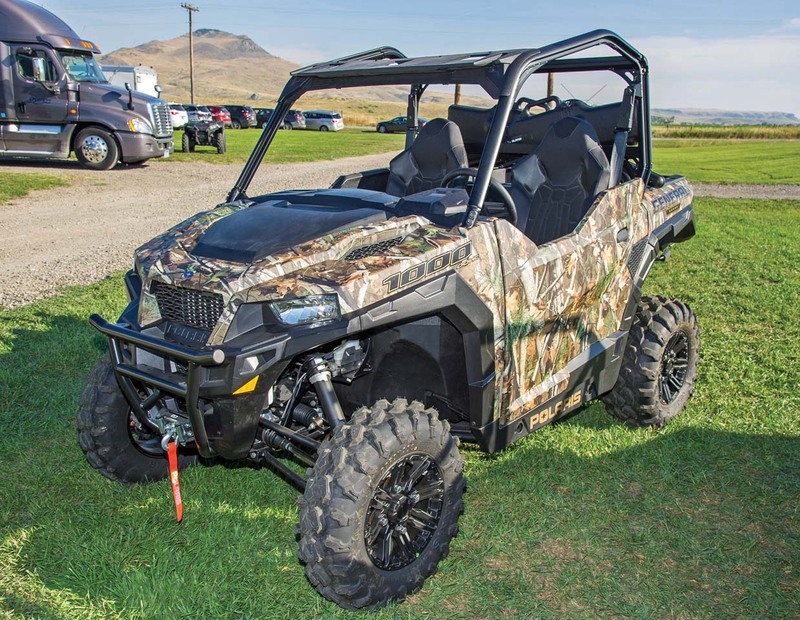 One area we have criticized Polaris for in the past is with their interior styling that didn’t match the look or capabilities of the vehicle. That surely is not the case with the new General. The cab interior is laid out very nicely, and Polaris finally put the instrument cluster ahead of the standard tilting steering wheel, and it tilts as the wheel does! One of the features we like most about the new interior is the seats which are cut and trimmed differently than on any past Polaris. The open relief areas in the seats allow for ventilation, and they are very comfortable. Adjustable seats also allow the driver to be in the optimum position to reach all the controls. 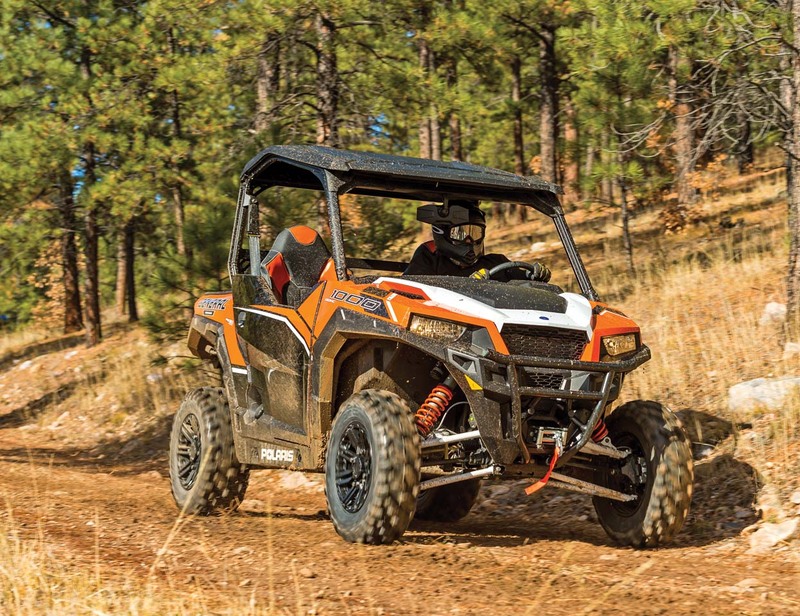 Polaris also seems to have anchored the seats differently than on some RZR models and gone is the rolling action that was common to some RZRs under hard cornering. We also believe the seating position is slightly higher than on the RZR, but not as tall as the seating position on any Ranger model. Overall we really like where Polaris is headed with their new styling. Storage is also hugely important to us and the General comes with plenty of storage in the dash, and in a handy center console between the seats just like the one in your truck. 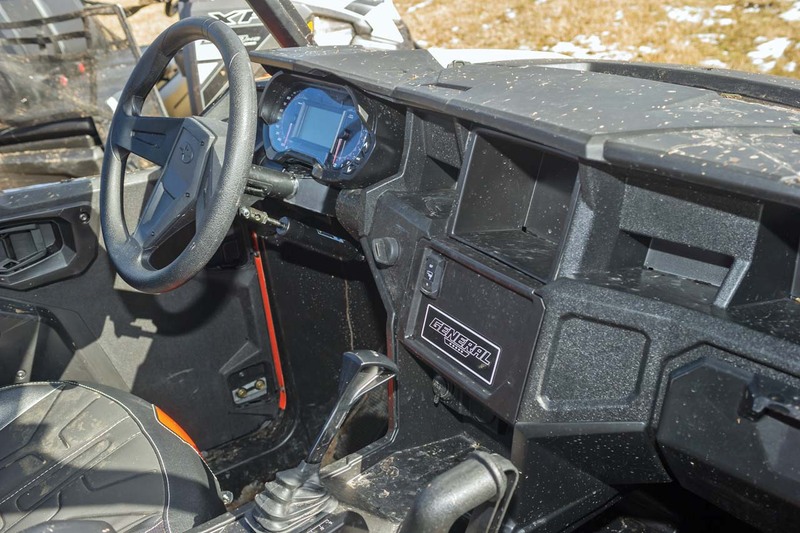 It’s the little details that count in every design, and Polaris went the extra mile by including a little rubber pad in open dash areas to help minimize vibration and keep your gear in place. Nice touch! There are three different models of General to choose from, and our Orange Burst General 1000 EPS comes with one other feature we really love: a radio! 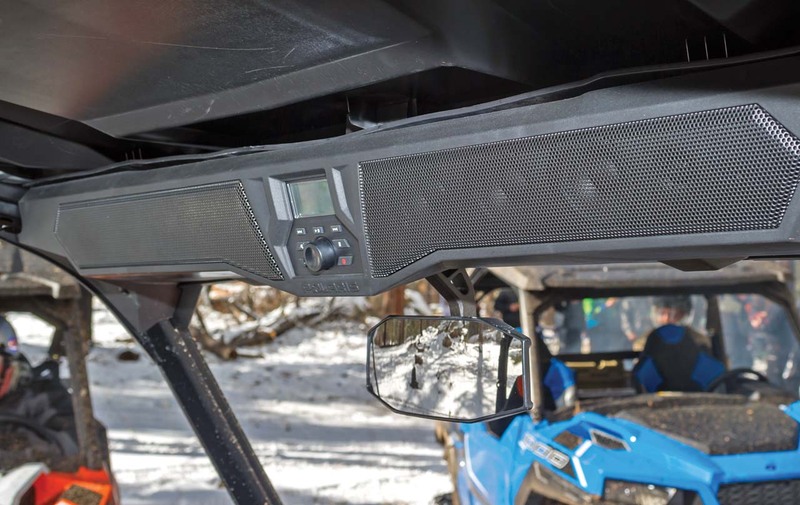 Built into the roof is a small AM/FM radio (Bluetooth capable) and it’s pretty cool to be cruising down the trails listening to tunes thanks to the 8 speaker MTX system. The real test of a machine isn’t how it looks, but how it performs and extended trail time often reveals both the good and bad. We can’t say enough about the cab of the new General. Once you climb inside for a ride, you easily settle into the comfortable seats, and it is by far the most refined Polaris. Rather than the rattle-prone T-Bar passenger hand hold on the RZR, passengers in the General get a very nice rubber padded hand grip, and a comfortable hand hold inside the door. From either seat it is extremely comfortable. A twist of the key brought the engine to life with a familiar rumble, and this revealed more great features. We really like the new Polaris display! The numbers are easy to read and it’s easy to scroll through different functions. We slipped the center mounted shifter into High and headed for the woods. There is no doubt the General is closely related to the RZR in the suspension department. It glides along the trail effortlessly, soaking up bumps with ease, with precise steering through corners. The slightly taller seating position was also evident, and we actually liked the feeling of sitting a little higher with a better view of the trail ahead. The trails we normally ride can have everything from downed logs to rocks, to water crossings thanks to beavers damming up every low spot in the woods. The General took them all on with ease. We sprinted down long, sandy snowmobile trails, railing through corners then back hard on the throttle at the exit of every turn. 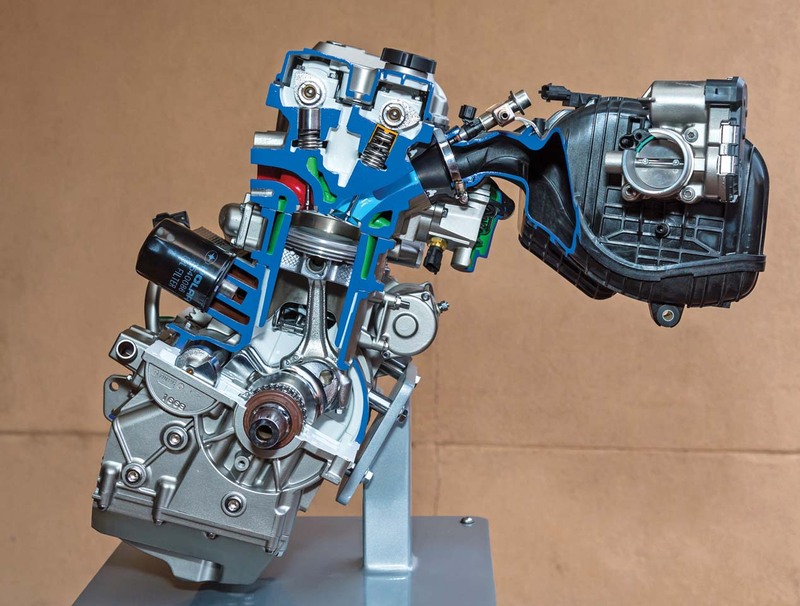 The fuel injected, 999cc ProStar twin cylinder engine delivers great power on the trail, definitely showing its sporty lineage with quick, crisp throttle response, but it also has been tuned for pulling a load and occasional work duties (100hp, 65 ft/lbs of torque). Point it down the trail, though, and hit the throttle, and it’s ready to run! At speed it handles much like a RZR 1000 but in a nicer package. It’s not all high speed action, though. Along the northern shore of Lake Michigan, there are plenty of places you can ride right down to the water’s edge which can be dunes, to cedar forest, to bare rock. The General was up for all of it! We easily carved and climbed dunes, then darted into the trees and tight woods following the lake shore. It was a blast. Where time, wind, and waves had washed the rocks bare, the suspension did a good job of soaking up sharp edged bumps. This was also a good opportunity to make some suspension adjustments. 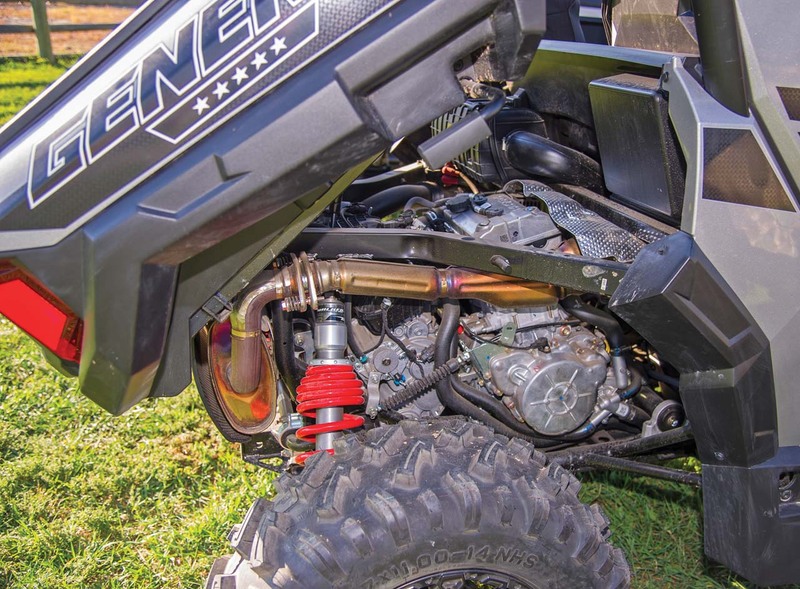 Most premium shocks have adjustable preload, compression, and rebound, but many riders don’t fully understand how to dial them in. That can actually make matters worse. The new Fox Podium X 2.0 QS3 shocks on the General 1000 EPS Deluxe take a lot of the guesswork out of it, thanks to simple adjustment and clear labeling. We love it! With plenty of harsh riding ahead, we dialed the shocks down to the softest setting and pressed on. The 12 inches of ground clearance was a welcome feature climbing over rocks and logs, and our new shock settings really smoothed out the ride. When it came time to attack the trails again, we dialed them back to the Medium setting and hopped back in. It’s our opinion the higher quality shocks on the 1000 EPS DELUXE model are well worth the extra price. It wasn’t long and we had another test of a clever Polaris feature. The saying “eager beaver” doesn’t begin to describe the industrious rodent that inhabits the Northern woods. Like many who flock to the woods, they too long to live on a private lake, and they do their damndest to make it happen with no regard for the neighbors. We’ve seen beautiful lakes big enough to ski on created by these critters. It seems like trail crossings are often an ideal place to begin their construction. Sure enough, we came across a beaver dam with water crossing the trail. We hit the 4wd button and waded into the water. What appeared to be an easy crossing quickly turned into a full-on pucker moment as the General dove ever deeper. With the water rushing up to the seat base, we quickly slapped the shifter into reverse and the General began to inch backwards and climb back out of the pool. It was then we discovered the doors seal tight enough to do a great job of holding water in the cab as well. Thankfully, Polaris includes two good sized drain plugs in the floor. As water rushed out the bottom of our mobile bath tub, we began looking for another trail. 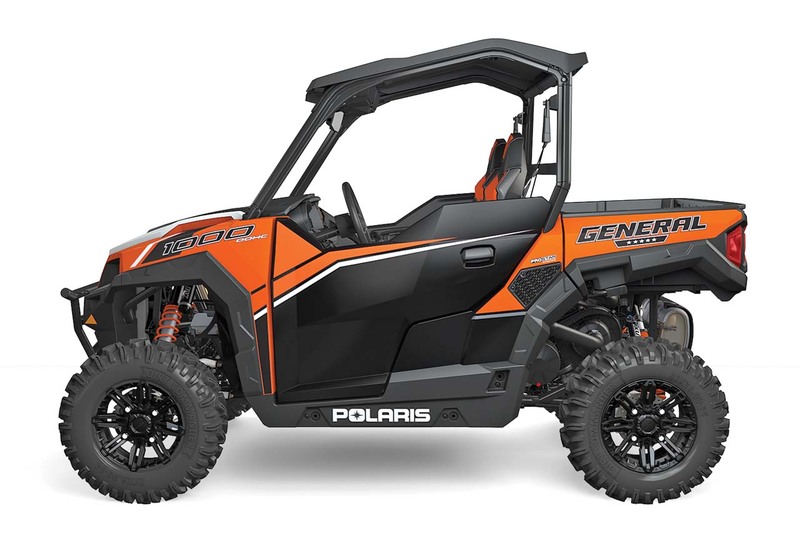 Regardless of the trail or terrain, the Polaris General was a joy to drive. 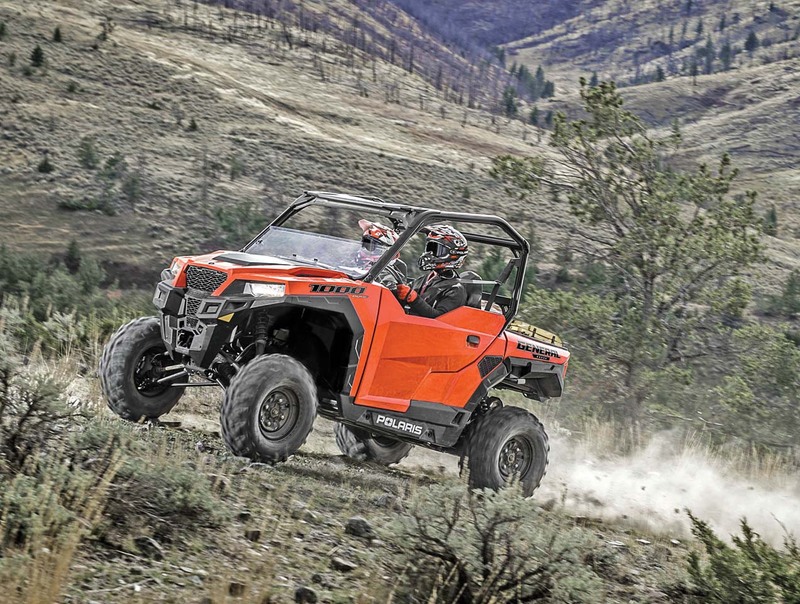 The only quirk we noticed is that it seems slightly louder than the RZR 1000, but it is also more comfortable. The GBC Dirt Commander tires do a good job in most terrain, but on loose terrain, they can sometimes hunt for traction which can make handling feel a little loose. The tires also tend to show wear on the leading edge quickly. However, they also seem to resist punctures. Often times we have to ask ourselves, “Who does this new machine fit?” With the General the question is, “Who doesn’t it fit?” For most of us, every purchase must be justified in some way. It’s easy to justify the decision to purchase the do-it-all General. It’s ready for plenty of work and play. In fact, there is no reason to own a RZR if you opt for a General instead. It can spend all weekend on the trails and still help out around the yard or farm during the week. The General is a true five-star machine!